The insoluble electrodes, which are mainly used for electrolysis and plating, are electrically and chemically insoluble or less soluble. In this article, we will introduce Tanaka Precious Metals Group’s commitment to insoluble electrodes. In the early days, graphite electrodes were used as insoluble electrodes. In the 1950s, platinum-plated titanium electrodes were developed to function as new insoluble electrodes that  are excellent conductors of electricity,  have excellent properties for both acid and alkaline electrolytes, and  are resistant to nascent oxygen. Thanks to their durability, platinum-plated titanium electrodes were once widely used for industrial purposes. In 1967, when Dr. Beer developed the ruthenium oxide titanium electrode, however, the Japan Soda Industry Association completely replaced graphite electrodes with precious metal-oxide electrodes. Recently, iridium oxide electrodes, which are high durability in oxygen-generating environments, have been developed and are now starting to be used. The fields of applications for electrodes have also expanded. Originally, electrodes were used primarily for electrolysis and plating. However, triggered by the alkaline ion water boom at the beginning of the 1990s, electrodes are now used in the areas of functional water, cosmetics and medicine (using functional water), the environment (water treatment), and corrosion prevention. Thanks to their electrical stability and excellent corrosion resistance, insoluble electrodes are used in a variety of applications, such as alkaline ion water, acid water, surface treatment, wastewater treatment, and electrolytic protection as well as for electrolytic plating.. In addition to platinum-plated electrodes, Tanaka Precious Metal Group offers electrodes for forming films of precious metal-oxide materials. 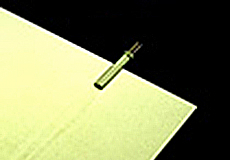 Electrode performance degrades when the minerals contained in water adhere to the electrodes (such minerals are known as "scales") while electrolysis of water is being performed. To prevent scales, we offer electrode products with improved durability for which periodic polarity reversal is performed to prevent scales from adhering to the positive and negative electrodes. Because of their wide-ranging applications, there is also great variation among the industries using electrodes. These industries include those involved in electronics and electrical components, surface treatment, semiconductors, the medical field, sewage disposal, the environment as well as energy, chemicals, and cosmetics. Insoluble electrodes can be used in a great many fields other than the above. Please contact us if you are interested in or have any questions FEATURE of TANAKA Precious Metals Group’s insoluble electrode products.